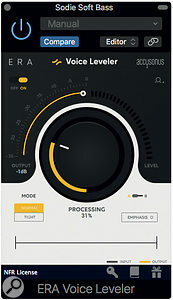 Accusonus' Voice Leveler is the latest addition to their ERA Audio Repair bundle, the Standard version of which already includes one-knob noise removal, reverb removal, plosive removal and a de-esser — the Pro version adds ERA-D for more sophisticated de-noising and de-reverb processing. Voice Leveler is included in both, and is also available separately. 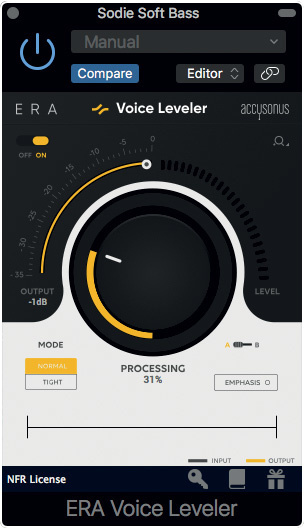 Voice Leveler aims to even out dynamic variations in the recorded voice, but it is not a conventional compressor; conceptually, it's more similar to something like Quiet Arts' Wave Rider or Waves' Vocal Rider, though it does not write automation to the host DAW. Accusonus' proprietary algorithms are specifically designed for use with speech, but good results can be achieved with other instruments, too. The deceptively simple user interface has one large knob in the centre to control the degree of processing, plus a curved bar that sets the output level, along with an equally curved output level meter on the right. A switch at the top left turns the plug-in on and off, and apart from that there's just one selector for Normal/Tight operation and another for turning on Emphasis. An intuitive waveform display shows the input waveform in black and the processed waveform in yellow. The Normal/Tight switch determines how fast the plug-in responds to the input signal: Normal delivers the most natural-sounding results, and Tight is for when you need something more assertive, whether it be rock, rap or radio. Emphasis brings in an adaptive enhancement process that can add presence to the vocal, but only where the plug-in thinks it is needed — an indicator illuminates when the plug-in suggests Enhancement would be appropriate. The manual doesn't give much away when it comes to explaining how the process works, but it's 'intelligent' and knows when to leave alone the spaces between words so as not to bring up too much background noise, spill or room tone. It also seems to avoid overreacting to inaudible plosives that can add a lot of very low-frequency content to the signal. Whatever goes on inside the code, the results are actually rather impressive, with no obvious artifacts as long as you don't max out the amount control when you don't need to. When you're processing a vocal that already has reverb added, the level of the reverb tail may get brought up at the ends of words, but in most cases you'd use the plug-in on a track prior to adding other effects. As suggested, the Normal mode suits most things where you don't want the vocal to sound processed, whereas Tight can produce a 'late night radio DJ' intensity to the sound. Both options have their uses, as does the Enhancer, which seems to know when the sound might benefit from a bit more top end. You may still wish to add compression if you routinely do this to add character to a sound, but at least when using Voice Leveler you won't have the unenviable job of first automating your track in surgical detail just to keep things under control. One thing to be aware of, though, is that Voice Leveler can be a touch CPU-hungry: on my 2012 Mac Pro it seems to use up most of the core it is running on but, oddly, putting a couple more instances on other tracks doesn't really seem to add much to the load. The other plug-ins that form the Standard Audio Repair suite are styled in a similar way and are just as easy to use. Though there are deep and devious plug-ins from other companies that give you more control, there's a lot to commend this one-knob approach if you're not an experienced audio restoration professional. I was genuinely impressed by Voice Leveler and can see it getting a lot of use. A de-clipper is expected to be announced shortly, along with a revision of the bundle prices.